Minimal living style is now more and more popular and be favorited by many people (both men and women) because it slims down significantly your everyday carries, keeps your trouser line flat and nice while helping you minimize the risk of losing your money, like pickpocket or accidental slippery. However, as there are too many brands change to this produce this type of convenient wallet, there is an avalanche of thin models on the market with so similar outlook, which sometimes, I even can’t find any difference between them. Other than slim silhouette and convenience, I personally love carrying a unique or creative skinny wallet that can do a speak for my fashion taste. I have tried so many and hardly any of them could satisfy my demand until Lethnic came to my life. It’s a small brand though if compared to other Giants like Napawalli, Travelambo or Serman. But they strike back with super distinctive designs including wise organization and unique outlook, which not any brands can achieve perfectly. Tell me, what was your problem when trying a minimalist wallet? Are their card slots too-tight-to-fit-nothing? Or, are they too slippery? I’m personally stuck in this same old problem all the time – the minimalist wallet fits all my cards and folded bills, but when it’s placed in my back or front pocket, it moves around in there and some of my cards fall out accidentally or almost fall out. It feels really insecure, don’t you think? So, when I finally found out this minimalist wallet from Lethnic, it’s more than just happiness. The double snap buttons on its side is very sturdy, firm and protective to hold my belongings in place, even if it’s cramped a little bit. Besides, its leather texture is a big bonus for extreme durability and luxe. Aside from the solid special brown, there are two other cool camouflage patterns with embossing for those who love military style. All of them come in three functional compartments which can fit both cards and bills in different sizes, such as member cards, bank cards and IDs. For minimalists, such organization is enough to keep your EDCs streamline. And speaking of capacity, I’m quite sure it won’t dissatisfy your demand. In maximumly, it can accommodate 10+ cards and 15+ folded bills without a burden. It will be inflated, but just a little bit so you don’t have to worry that this little bad boy would thicken your pocket. On top of that, rest assured of its built-in RFID Blocking Technology that can prevent all 13.56 MHz Frequency Signals. Be aware that all card slots are equipped with this useful shield for extreme security. And this one, it’s something like a brand identity of Lethnic with a stylized L-shaped flap on the frontside. It exposes three inner card slots with contrasting colors to even emphasize its outer performance more. Particularly, you can entirely take advantage of the space of this flap to put in some other folded receipts or bills or stuff like that while still ensure the flat silhouette to stay in your front pocket. Other than this special storage space and three inner card slots, there are two other slots on the backside – including one card slot and one ID window. In the middle, it’s a spacious cash compartment which you can place around 7-12 folded bills neatly. In generally, this little boy can hold 5-7 cards and 10-12 bills conveniently. No tight! No cramping! 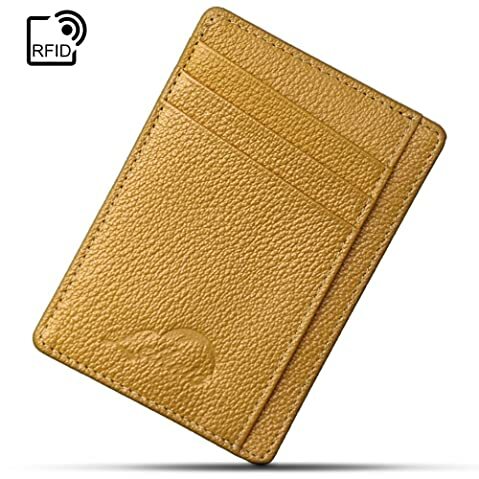 If you wonder about its material, feel ease in mind that with this RFID Thin Wallet in particular saying or other ones from Lethnic in generally, they will be made out of 100% genuine leather with guaranteed high quality and durability to serve you for years. Another highlight is its embedded RFID Shield to save you from identity thieves. thinking of this wallet as a special present for your loved one is also a good idea as its packaging is perfect for that role. I love this skinny wallet the most for its super flat silhouette and sophisticated design. 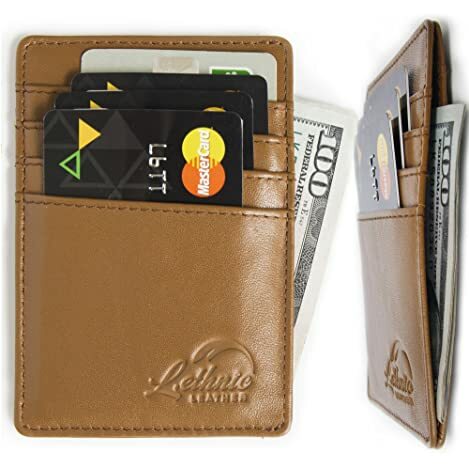 Like many other slim wallets, this model comes up with small dimensions – only 4.33 x 2.95 inches and some card slots, a bill compartment and other functional slips. But the best thing about it is the stylized curve on each card slot which helps significantly to easily access your regular cards. I used to go crazy of my last skinny wallet because of its difficulty when I put in or take out my cards (though it fits my cards like a glove). Besides, the high-quality lining is another great plus point as even if you don’t use your cards regularly, they won’t stick to the leather material. 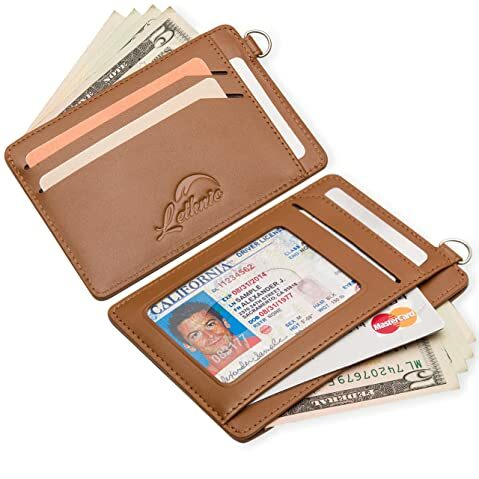 And this is also a must-consider feature when it comes to choosing any leather wallet. Keep that in mind! Now, here is where the real fun begins, its little D-shaped ring. Don’t quickly judge a book by its cover! You can have a lot of funny games with it. 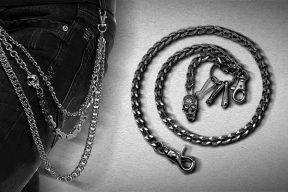 Aside from hooking it to your belt loop or backpack or keys, you can attach a lanyard and utilize it as your employee ID card holder, but the way more convenient because other than your IDs, it can accommodate your cards and cash to quickly pay you a drink or some foods during your dinner. 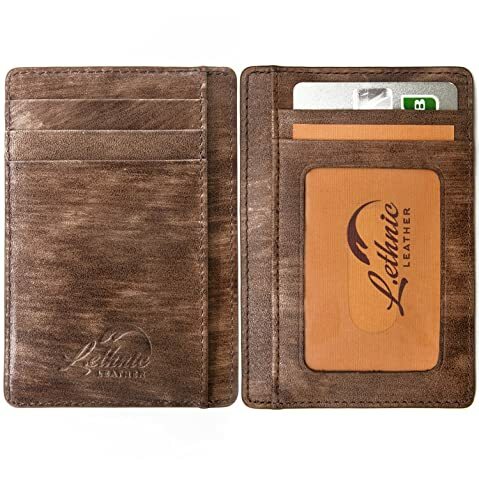 Though made out of high-quality cowhide leather, due to its slim and small silhouette, this wallet is quite lightweight to stay in your neck comfortably without straining your body down or cause pain. Awesome! If you are a sporty person, particularly a baseball die-hard fan, I bet you will love this design a lot. It is inspired from characteristic baseball curve but more advanced. While other Baseball Wallets out there on the market utilize this feature just for decoration, this wallet’s takes the role of a smart thumb strap for quick access. 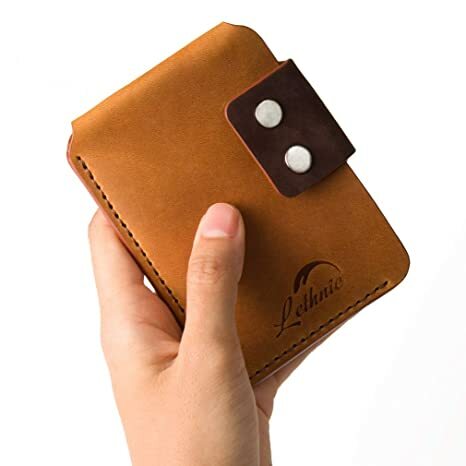 I personally appreciate the leather process of Lethnic on this wallet because unlike many slim wallets that I know which are usually flimsy and weak, Lethnic Baseball Slim Wallet comes in a sturdy silhouette that can hold its form pretty well to give me a clear feeling that it’s going to protect my belongings better. Besides, if taking a closer look, you will see that its stitching and seam are really strong and tight. Plus, its stainless-steel D-shaped ring is very durable to keep this wallet serve you for years with as less wears and tears as possible. And don’t underestimate the power of this small keychain, coupling with the clear ID window on the backside, you can utilize it as your employee ID card holder but way more convenient as it can accommodate your properties to readily pay for a lunch or a dinner when you’re out during your break time. Lastly, I also love its colorway as well. There are three for you to choose from: red, brown and green with nice names. I’m sure that every time drawing this little bad boy out for any payment, it will impress your surroundings. I’m not sure that this wallet is the thinnest model on the market, but I can do for its convenience. Particularly, you nearly don’t feel that it’s in your pocket. If you are afraid of its too-small silhouette to fit nothing, then don’t. It’s measured to achieve the best compromise of design and function which ensures the slim and small figure while providing you enough storage space for a minimalist’s EDCs. With 4 card slots, 2 slips, 1 ID window and 1 bill compartment, it can fit 7-9 cards and some small changes without a burden. On the contrary, your belongings will be kept streamline and neat. I appreciate its genuine cowhide leather as well. It’s high quality, durable, soft and smooth that I bet you will be satisfied right away. Particularly, there are a lot of color options to choose from. Another benefit that I think not many people pay attention to is its lining. Very thick, durable and good material to prevent my cards from sticking to the leather. This might be one of the most common issue when you choose to use a leather wallet so, a good lining is the best life saver. And did I told you that this wallet is backed by a 30-day warranty? Now, I guess that many of us would love a darker-color wallet to mix and match with your vintage or basic style, right? And this is my recommendation. It comes up with lots of basic colors such as brown, special brown and green that are easy to style with. Meanwhile, there are many interesting shades with different kinds of embossing though all of them are made out of high-quality genuine cowhide leather. Amazing, right? That’s why I love Lethnic, their creativity is endless. Besides, it’s functional and protective with the built-in RFID Shield to block all 13.56 MHz Frequency Signals. With this wallet, you can go out or travel to anywhere you like with no fear of hi-tech thieves. Thinking of this wallet as a great present for your friends, family or lover is also a good idea. Lethnic Slim Wallet arrives in a nice packaging so that you can take advantage of it for a gift box. 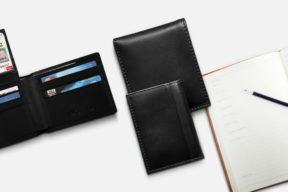 Go basic with this Lethnic Men’s Minimalist Wallet! 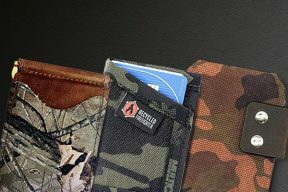 You don’t ask for an ID window, or a keychain, or a unique outlook but just a simple, durable and slim wallet to hold and organize your belongings safe and sound. Here’s what you are looking for! It comes in 5 different color options, most of which are dark, cold and basic tones to suitable for almost men’s outfits. It’s easy to style with no matter which kinds of your fashion is. And the functionality, really satisfying! First up is the leather texture. It’s genuine, high quality to deliver a soft and smooth feeling touch. Besides, it’s durable and long-lasting which partly due to the tight stitching and strong seams. There are 7 card slots and 1 more spacious compartment in the middle where you can put in a couple of folded bills. It fits nicely all EDCs of a minimalist person, including some regular cards and changes. 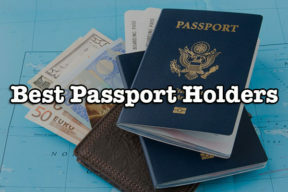 Besides, every single card slot is embedded with RFID Blocking Technology to ease your mind of identity thieves. It’s perfect as a daily-used wallet, a travel wallet or a present for somebody. Importantly, it’s backed by the manufacturer for money risk free within 30 days. 7 pieces to go, which will you choose to try first? The best thing about Lethnic is they know exactly the demand and requirement of a group of specific customers to make a satisfying wallet. 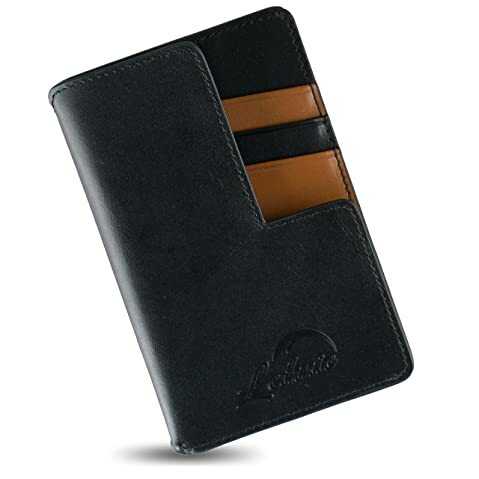 For example, while the 1st wallet is suitable for sporty people who love something sturdy, hard and super durable to bears abusing, the 3rd wallet is the best choice for those who are office worker. Besides, I love their customer service as well. They are ready to answer your quests as well as solve your problem right away when you’re in trouble with their products. They keep their promise to refund or give you a replacement for the defaulted one. So, you always feel ease in mind that they always behind you and get your back.